A practical and fun family vehicle with so much space!! In our early 20s, my husband (then boyfriend) and I quit our jobs in the UK and drove around Australia in a 1974 VW Kombi that we called Bessie and had THE time of our lives, endless adventures and made the best memories. Where do I start?! 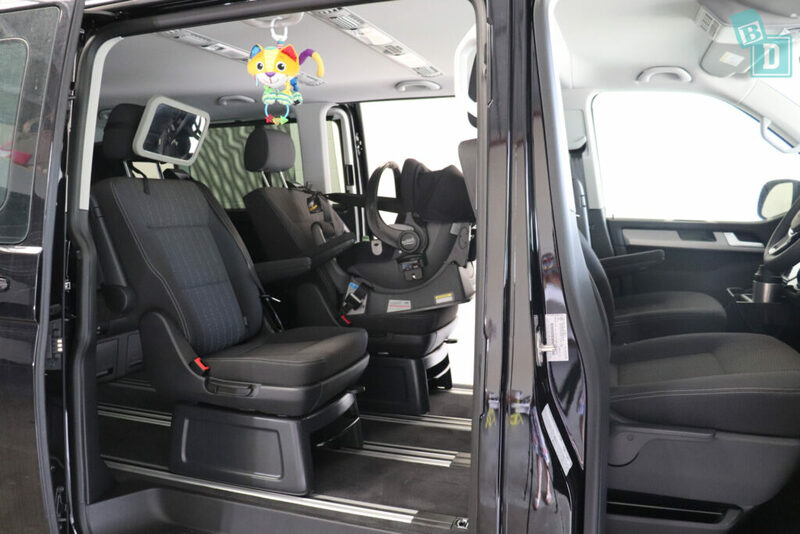 Who would have imagined a van so big you can walk around inside it would be sooo userfriendly with kids! It started to change the way I thought about cars and how I wanted to use them, I could get in at any door, walk to where ever my daughter's seat was, strap her in, and then walk through to the front seat. 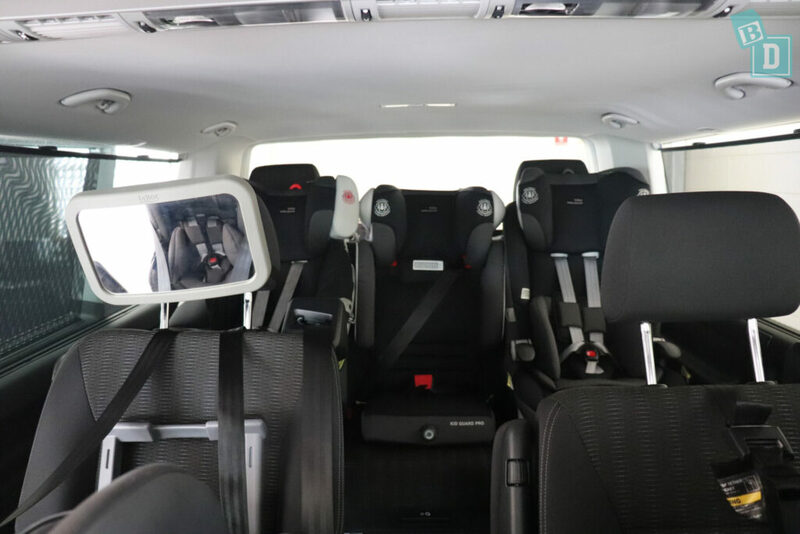 I imagine if you have more than one child it is a huge time saver because you can just walk from seat to seat doing them up without having to origami yourself through small gaps, go around to each side of the car, bring seats forward and back, uninstall and re-install child seats etc. Also, the side doors slide along rather than opening outwards, which has the same benefits in car parks as I found in the Honda Odyssey and the Kia Carnival. 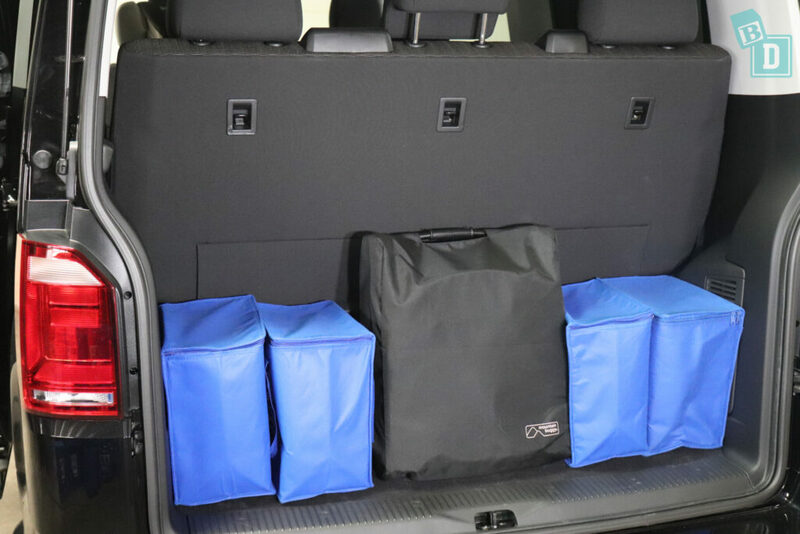 With the seats positioned so there was enough room for a 182cm passenger in the front and third row and a rear-facing child seat in the second row, the boot space was still EPIC!! I could stand up a tandem, twin or single stroller in the boot space with shopping too!! We used it as a family of four and just LOVED that we could throw anything in the boot without consideration for whether it would fit! Paddleboards, stroller, Esky, kids toys etc. Now we come to the seats. There are two individual seats in the second row which independently slide forward and back and even turn around to create a living room style space in the back of the van (which we did use for a few lunches in with our girl) although I should mention you can not travel along with the seats facing backwards with child seats fitted into them. Both second-row seats have ISOFix and top tether and child seats fitted in both nicely. The third row is a bench of three big adult-sized seats, which are super comfy and three child seats fitted easily across them. All three have top tethers and the two outer seats have ISOFix. Storage in the front is excellent and the doors had more storage wells than even our daughter could fill with small plastic toys or apple cores, however that didn't carry through into the rear. 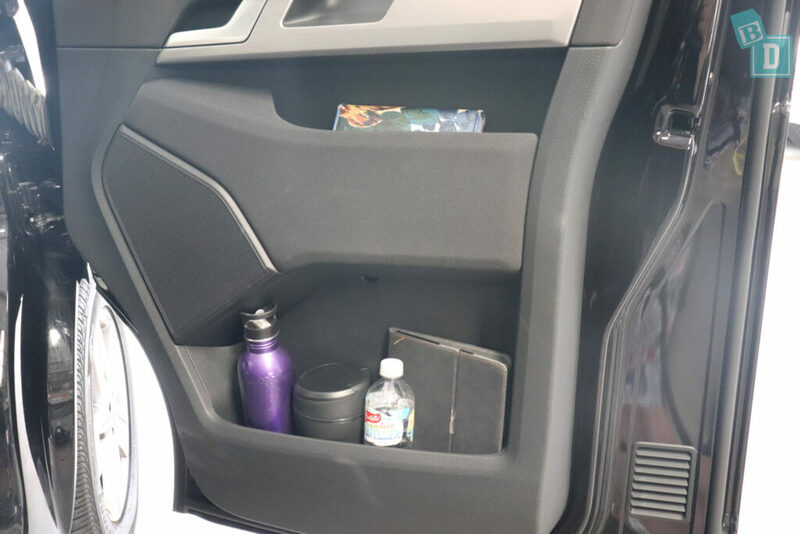 The second row has two map pockets and two drawers underneath the seats but there are no cup holders at all for the second or third rows and, of course, the rear seats are too far back to pass drinks and snacks while driving! The rear side windows all have built in window shades, which is fantastic so you don't have to worry about keeping little passengers shaded from the sun on car journeys. The drive was surprisingly nice for a van. 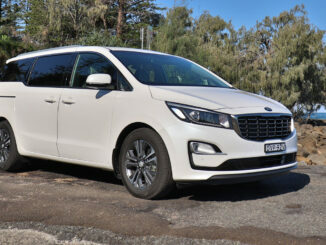 We tested the long wheelbase variant and I have also driven the smaller model too and both were great. I did feel its size when I did Kindy drop-offs in their tight little car park, when I thought to myself “you are dropping off one child in a vehicle the size of your house”!! It actually wasn't too difficult because the reversing cameras and the big side windows made visibility better. But I did not attempt to negotiate parking between all the other parked cars! 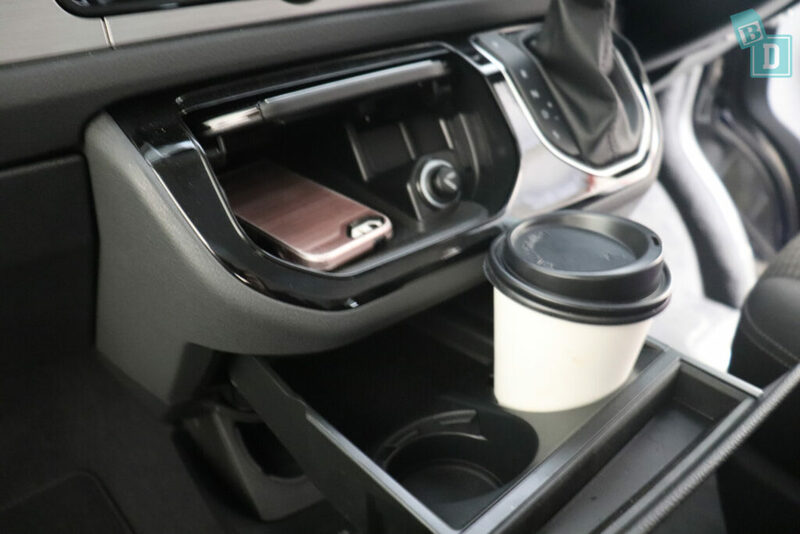 I found the lack of cup holder storage in the back irritating over our week, there was nowhere for my daughter's cup, snacks etc and it was too far back for me to reach to pass them (I believe they can be added as optional extras). Another little niggle in the back is the ceiling mounted interior lights and air vents which were a constant source of amusement for my testing toddler!! The lights are controlled by a simple rolling switch and it was not obvious at all that they were on so I found they could be left on all day without you noticing. 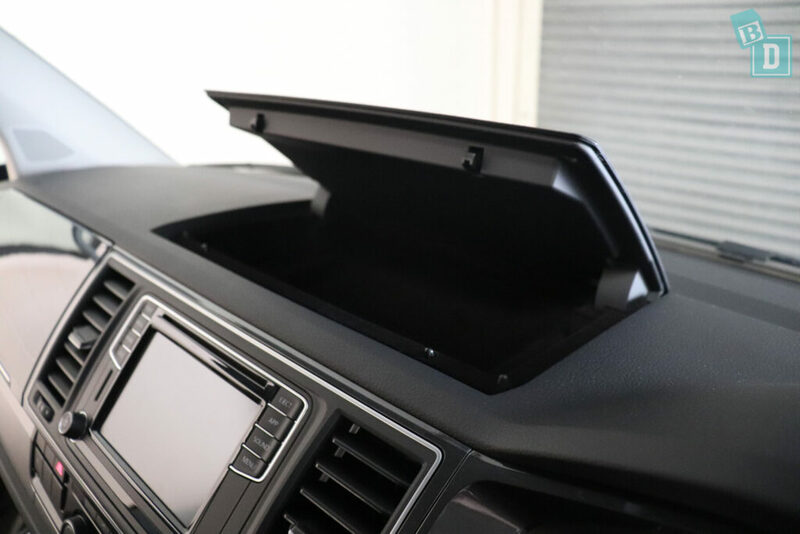 On the same note, the Multivan's air vents are not reachable from the front while driving but they are reachable by larger young passengers so you end up with an air and light free for all in the back!!! 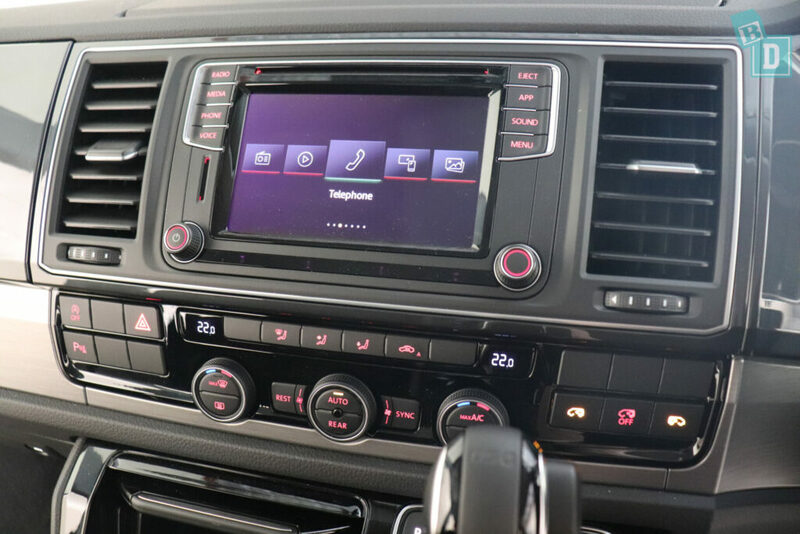 The media system does have Apple CarPlay and Android Auto and the system is simple to use. The reversing camera image was clear however I found the Park Pilot far too sensitive, loud and continued beeping at anything and everything, even when sat still in the Kindy car park with the car in ‘park'?! 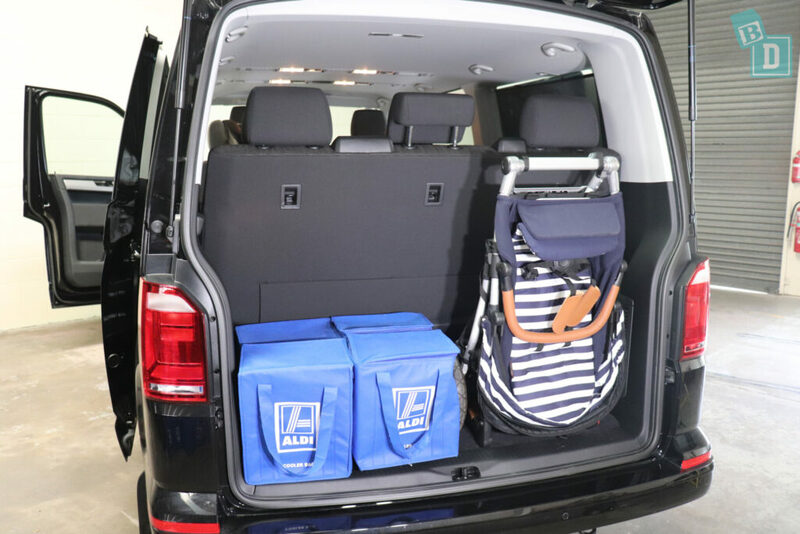 The VW Multivan is an awesome BabyDrive! 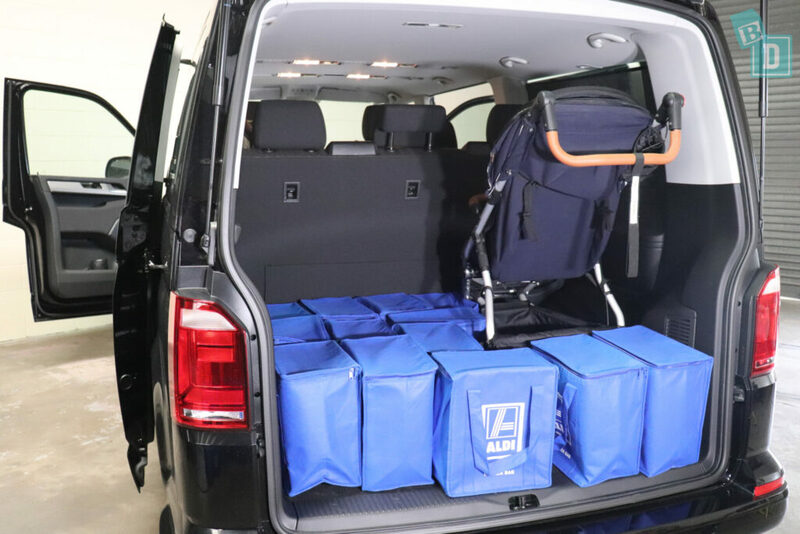 As a family with only one child I would opt for the shorter wheelbase because I could still get my daughter in the back ith oodles of space and have room in the back for our paddleboards, stroller etc. For larger families it's so versatile, I didn't test it but you could probably get your bikes in the back too! The VW Mutlivan has not yet been tested by ANCAP or given a safety rating overseas. 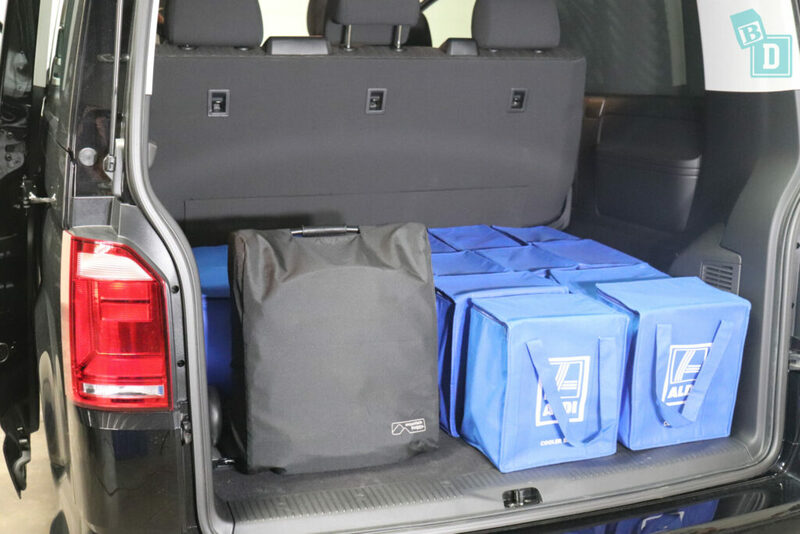 How much can you fit in the boot of a VW Multivan? With the seats in the position I described, from empty I could fit 20 shopping bags in there. All the strollers fitted standing up in the boot with shopping bags around them which was something quite special! Being able to put our stroller in the boot without collapsing it meant I didn't have to unpack everything out of the basket at the bottom and empty crumbs etc all over the boot floor!! The Mountain Buggy Duet twin stroller fitted standing up or collapsed with nine shopping bags around it. The Britax Flexx tandem stroller fitted lying down with fourteen shopping bags or standing up with twelve. The Mountain Buggy Urban Jungle fitted laying down with ten shopping bags or standing up with thirteen. The Mountain Buggy Nano stroller fitted with sixteen shopping bags around it. You could definatley get any size dog in the back or maybe even a small horse!!! 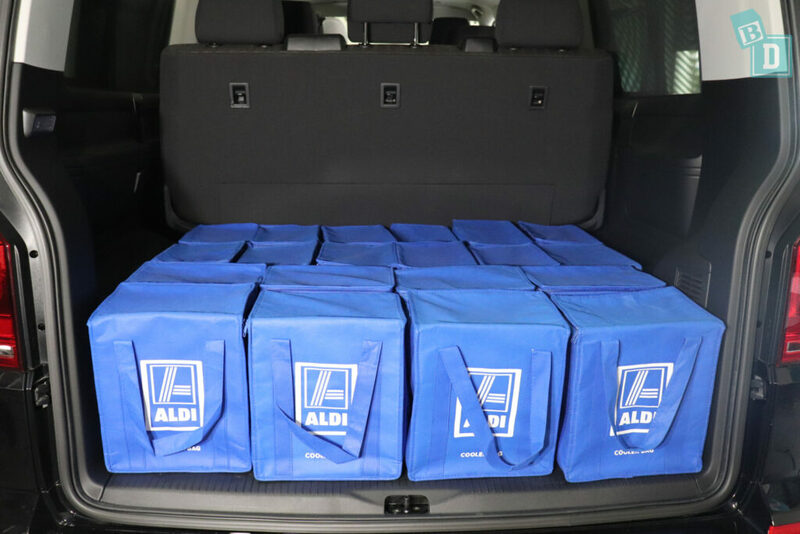 I then moved the third row seats into their furthest back position and and I could get eight shopping bags in the boot. Or the Mountain Buggy Duet twin stroller and three shopping bags. Or the Britax Flexx Tandem stroller fitted but with no bags and was quite difficult to balance in the boot space. The Mountain Buggy Urban Jungle single stroller fitted with four shopping bags beside it. The Mountain Buggy Nano compact stroller fitted with four shopping bags beside it. 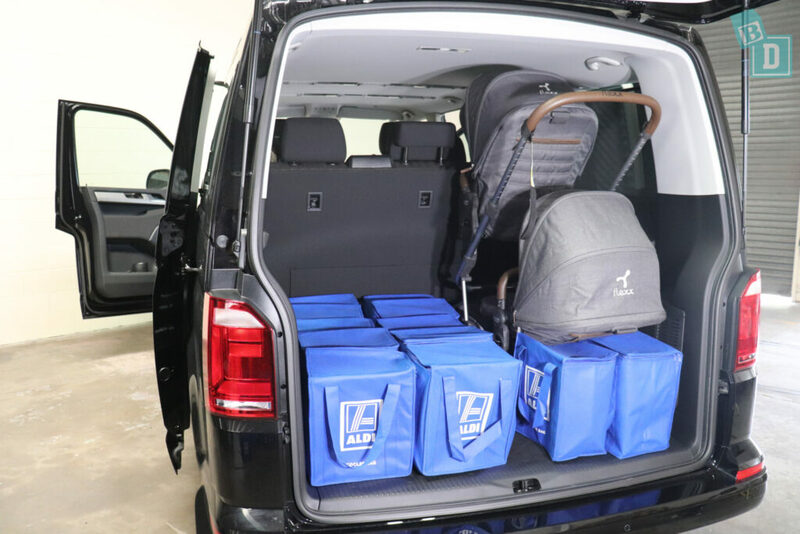 Storage in the fron tof the VW Multivan is excellent. The door bins are enormous and would hold a large refillable water bottle, an iPad, 600ml and the big rubbish bin that comes with the van. There is also a shelf below the handle, plenty big eough for my purse and a well in the top with the handle. 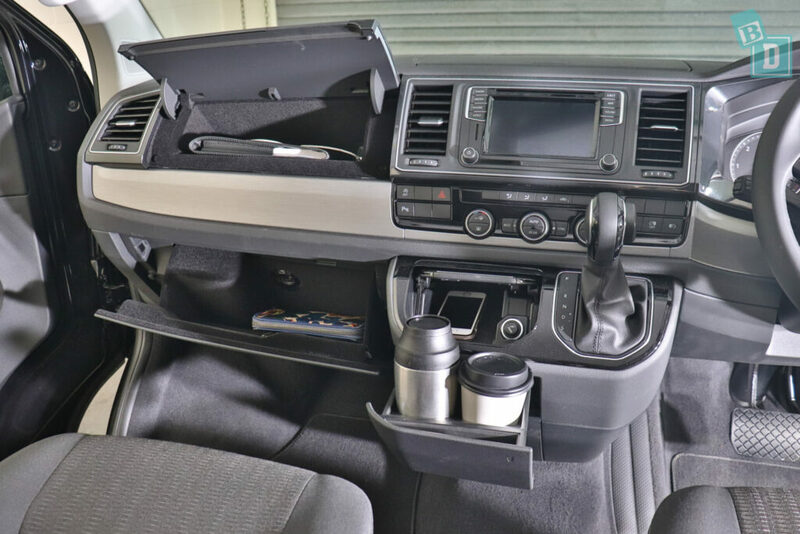 There are two cup holders in a pull out drawer in the middle of the dashboard. They are a good size for a disposable or re-usable coffee cup but two cups at once often rub together and juggle about, and a large refillable water bottle wouldn't fit. In front of them is a rubber-lined well I found good for storing my phone. There is a 12V socket in there too. Underneath the cup jolder drawer is another pull-out drawer that I found my large refillable water bottle would fit in or perhaps even a wine bottle!! There are two glove boxes; the lower one in the usual position is felt lined and large enough to hold my wallet. The top one, in the dash, has the USB connection points in it and the manual. 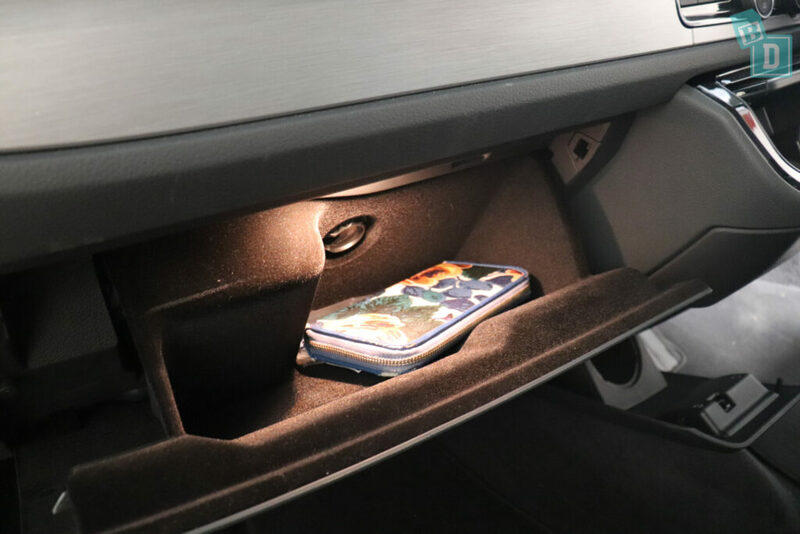 Neither glove box would hold an iPad. Also on the dash, above the media screen, is another lidded storage tray, that is also lined, but anything left in there could get quite hot in the sun. In this model the storage in the back was minimal. There are map pockets on the back of both front seats that would hold and conceal an iPad. The back of the second-row seats have large drawers underneath, which were excellent on a road trip for storing all our daughter's ‘things' aka small, colourful plastic things!! That is it for the rear seats though!? 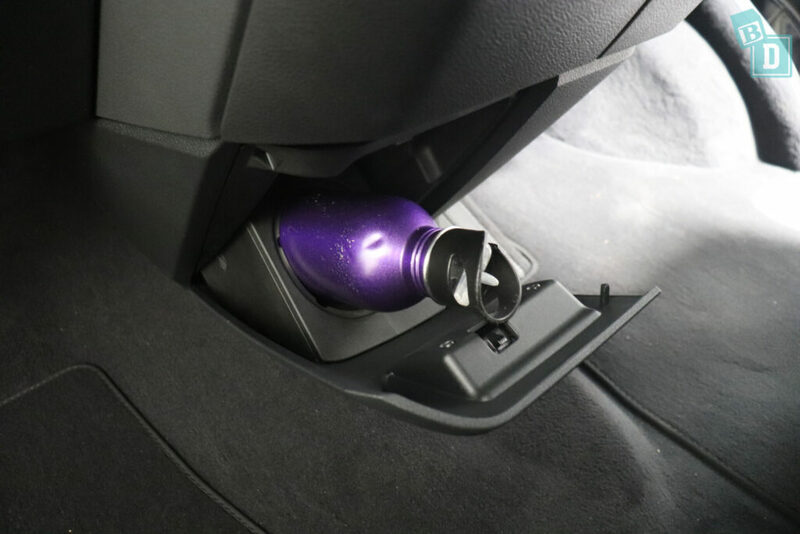 No cup holders in either rear rows, which did make it super tricky with drinks cups etc on journeys. When I previously drove a short-wheelbase variant it had under-seat drawers in the third row too but this one had the only cover flaps for the drawers but they were empty. 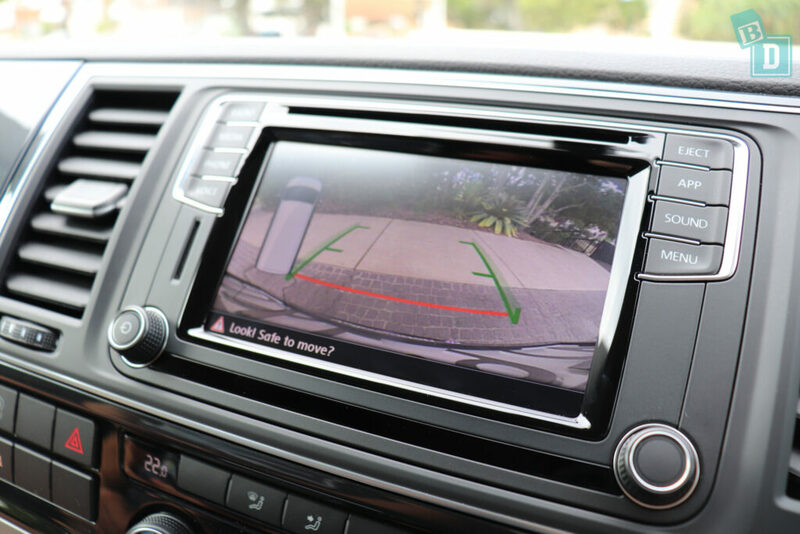 The rear camera in the VW Multivan has quite a clear image and is vital for reversing and maneuvering such a big vehicle. The sensors can be muted with a button on the screen. I did find the Park Pilot far too sensitive in the Multivan. For example, I sat with the engine running in my daughter's Kindy car park while I gathered myself together after dropping her off in the morning and even though I was in ‘park' with the handbrake on, the park pilot was beeping constantly at any leaf, child or plant that blew anywhere near it! Even when auto-engine cut out kicked in and the engine had turned off, the sensors would beep constantly! I find in any car that is over sensitive it becomes like the boy who cried wolf. The auto engine cut out and parking sensor switches are on the same control panel on the dashboard. 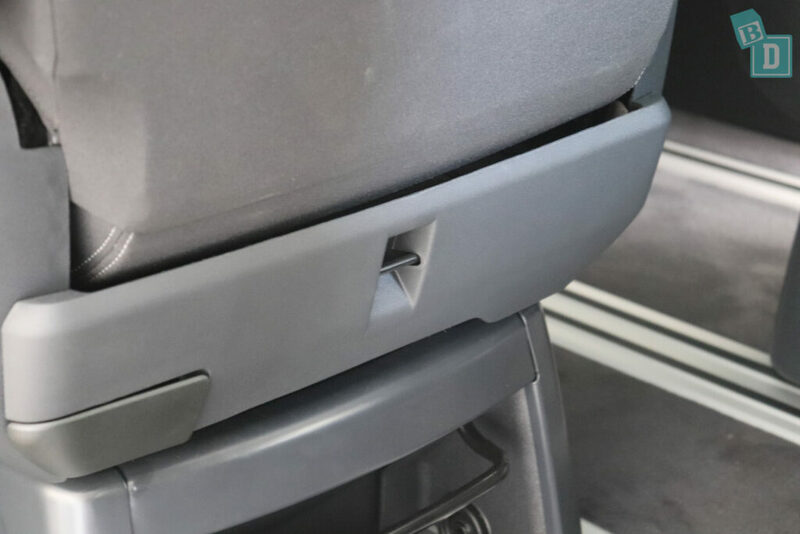 On the opposite side of the aircon controls are the buttons to open and close the rear sliding doors which are handy too and I found I used them a lot to open and close the doors when picking people up. The indicator volume in the VW Multivan is not adjustable, but it is quite a mild sound so I didn’t find it affected my daughter while she was sleeping. 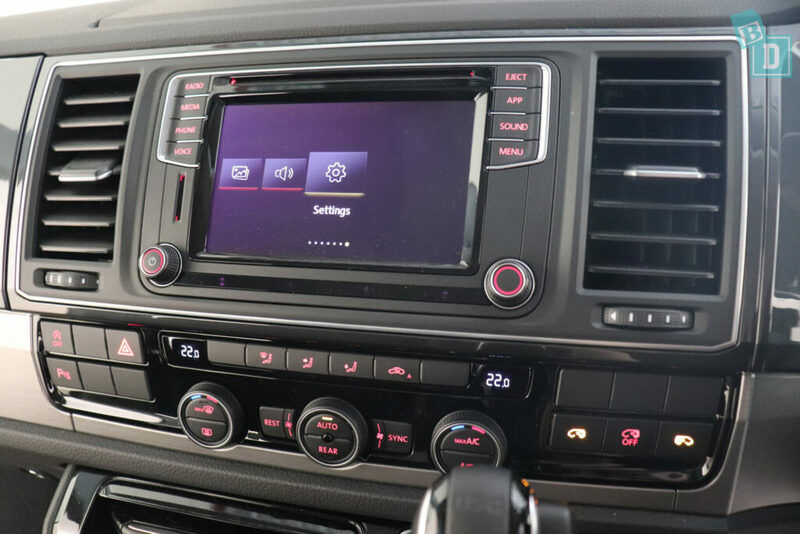 There is Apple Car Play and Android Auto in the VW Multivan and I found the media system easy to navigate and use. 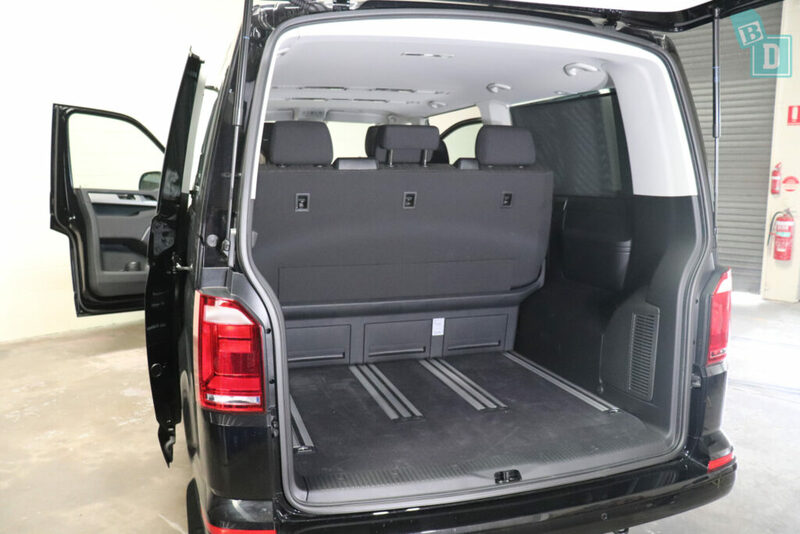 The front doors and windows of the Multivan were not too noisy to open and close but obviously the rear sliding doors close with an anyone waking slam! When camping in it, woe-betides anyone who needs to get up in the night to go to the toilet!! Road and engine noise are surprisingly good in the Multivan, and the ride is much less ‘van-like' than I imagined it would be! The seatbelt removal alarm is only for the front driver's seat which is pretty pointless because you know if you have your own seatbelt on! It's the other six passengers you can't see that you need to know about! 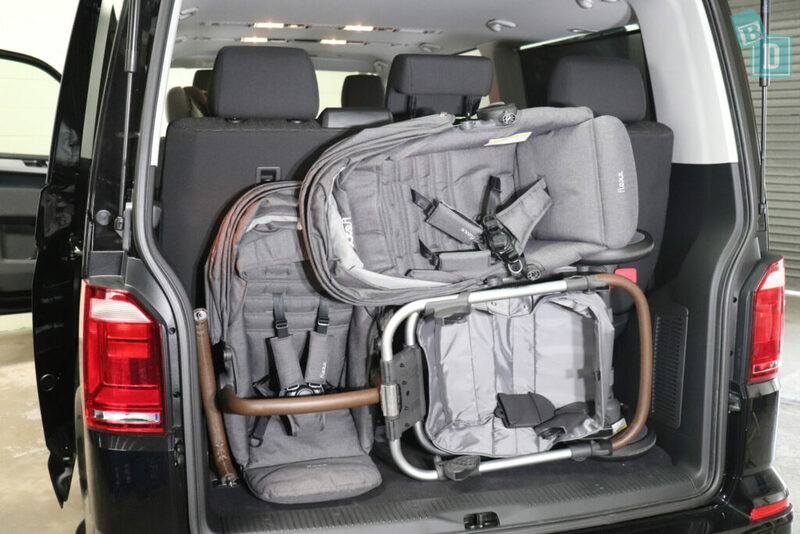 How many child seats fit in the VW Multivan? Five!!! Wooo Hooo!!! There are two individual seats in the second row that both have ISOFix anchorages. They are not within plastic guides and were actually quite tricky to connect to as they were a bit buried in between the cushions of the back and base. The top tether anchor points are on the back of the second-row seats and right at the bottom. They were easy to connect to but I found for one of the rear-facing child seats they needed an extension strap. The second-row seats I found much easier to slide when I was inside the van, as from outside I wasn't tall enough (I'm 162cm) to have the leverage to push down on the seat while I pulled up on the bar at the front of it. Whereas my husband who's 182cm could easily do it! These seats also slide backwards and forward a large distance and you can also spin them around to create a little living room like space in the back! We did this on days out when it rained to have our picnic in the back, it was great fun!! You CANNOT drive along with the seats facing backwards if child seats are fitted though. The third-row seats are a really nice generous bench seat that is plenty big enough for three grown adults to travel comfortably in. Three big forward-facing child seats fitted really easily or I could very comfortably travel between two child seats. 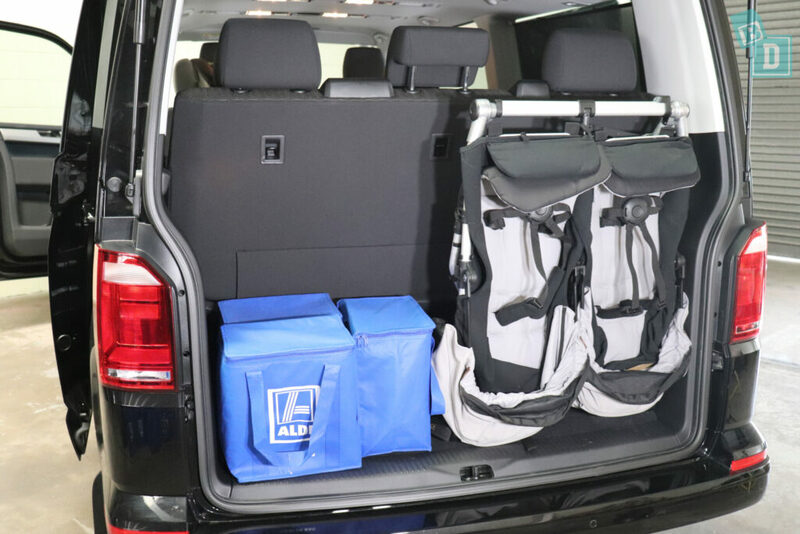 There are top tether anchor points in the top of the back of all three rear seats. There are within plastic guides and nice and easy to connect to. I tested a rear-facing child seat in the third-row seats too and the top tether strap did reach the anchor points, because they are higher up, without an extension strap. 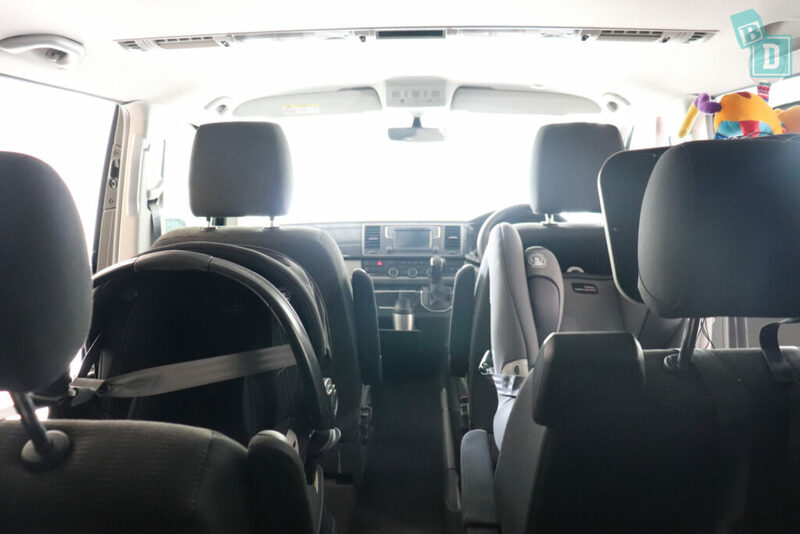 There are ISOFix anchorages in the two outer seats but they are not within plastic guides and equally as tricky as those in the second-row seats to connect to because they are so buried in between the back and base cushions. The third-row seats slide backwards and forward an enormous distance. 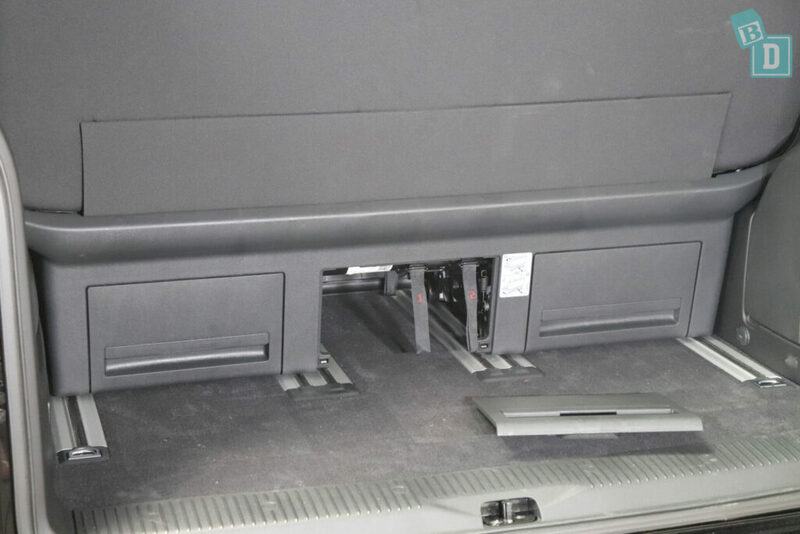 You can do it from inside the van, or I found it easy through the boot too, by pulling the first tab that is behind the central drawer cover in the back of the seat bases. I usually find with Volkswagen seats that the headrests are not removable and they push on the head section of some forward-facing child seats that I install. However, I did not find this a problem in the back of the Multivan. 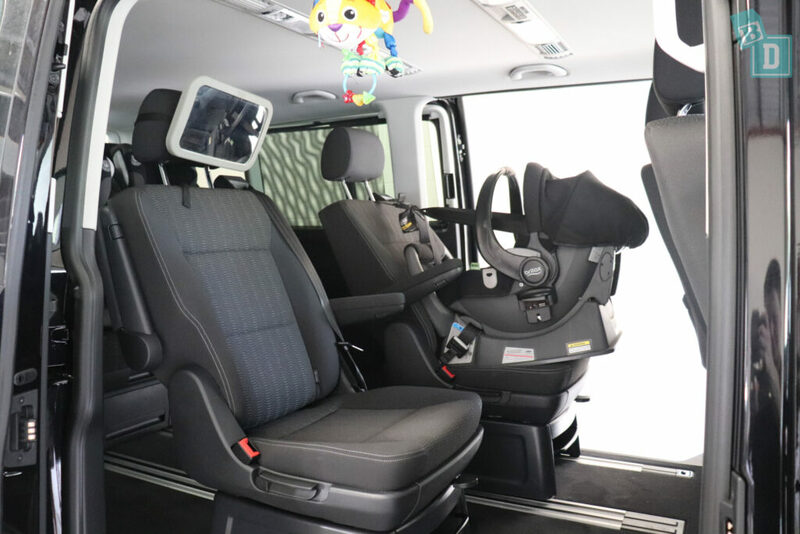 One of the options available in some of the vehicle variants is in-built child booster seats in the second-row captain's chairs like the image below. Our test vehicle didn't have those though so I couldn't test them. 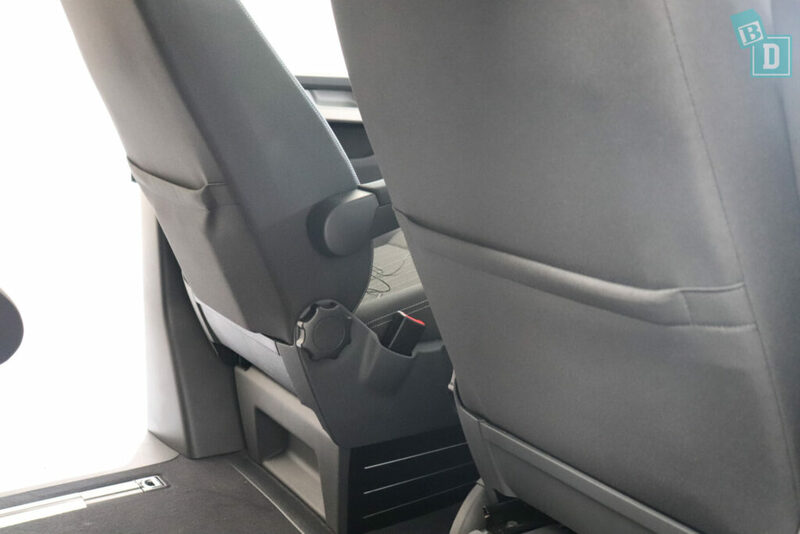 The front seats of the VW Multivan are quite comfortable, although I did find even in the driver's seats lowest position I wanted to lower it a little more (I'm 162cm). The first and second-row seats are like captains chairs, they have adjustable armrests and sit on a tall plinth-like base. They are upholstered in woven fabric which was quite inoffensive but would get spills and crumbs ground into it and be hard to clean. I found I couldn't wear a ponytail with the headrests. The second and third-row seats are comfortable too; those in the second row are individually manually adjusted and the third row slides as a whole bench. 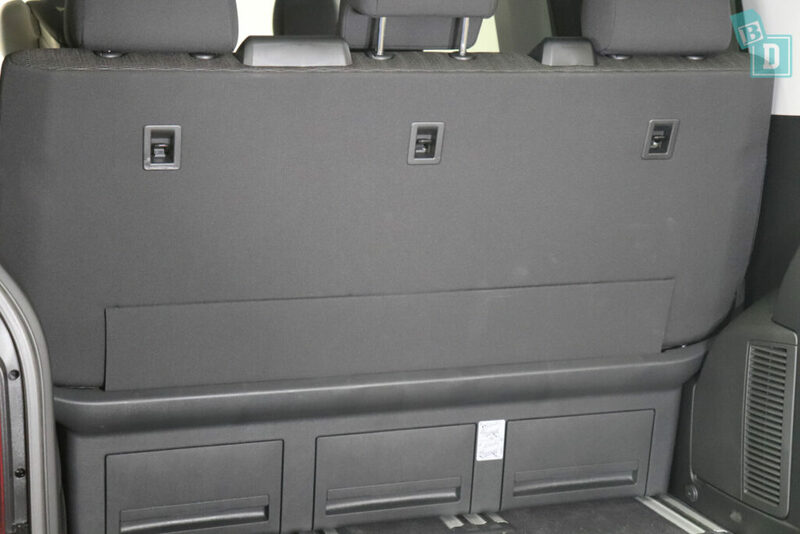 Legroom in the Multivan is exceptional but it is a long wheelbase van so there is just sooooo much room inside! 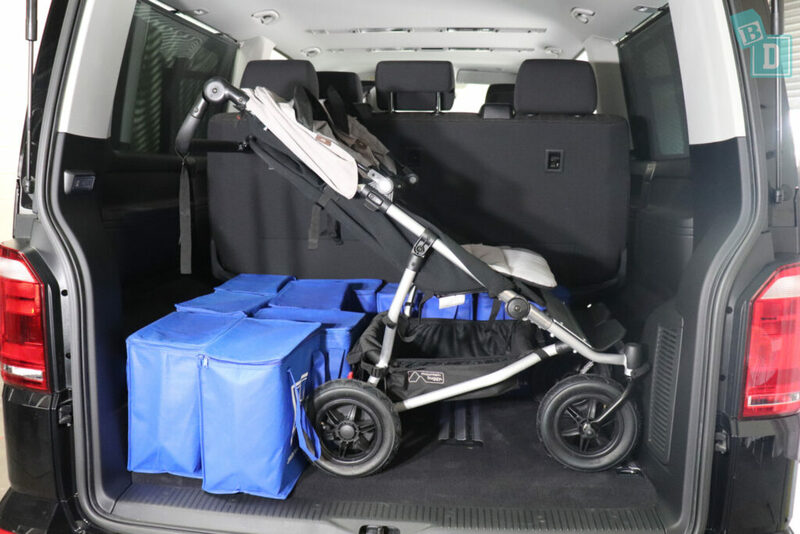 I tested a 182cm driver, a rear-facing child seat in the second row and a 182cm passenger in the third row and there was room for a twin stroller standing up in the boot with all my shopping too! 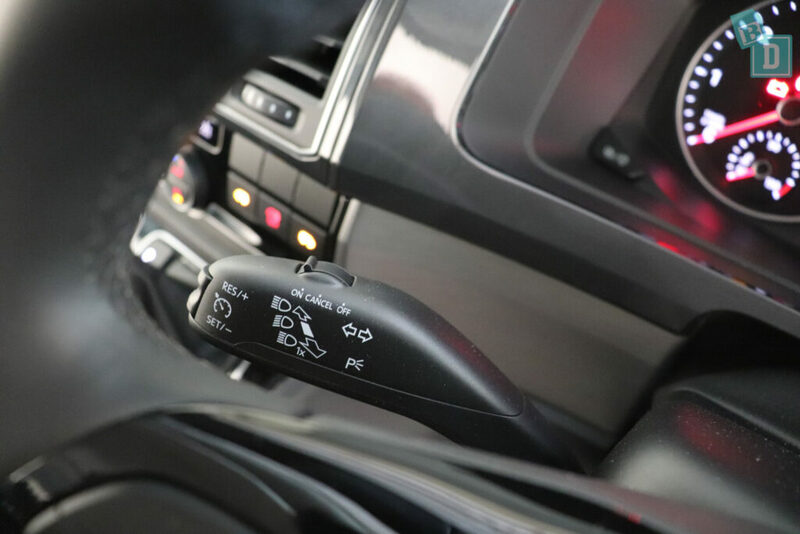 The cruise control buttons are at the end of the indicator stalk, they are relatively simple but I do prefer having them on the steering wheel where I can easily see what I am doing. The cruise control was surprisingly good for a van! It was accurate at high speeds on motorways and remained within 5km of the set speed at 60km/h on undulating roads. The digital display in front of the steering wheel shows the distance to empty for the fuel, which I find fantastic and wouldn’t want to be without! 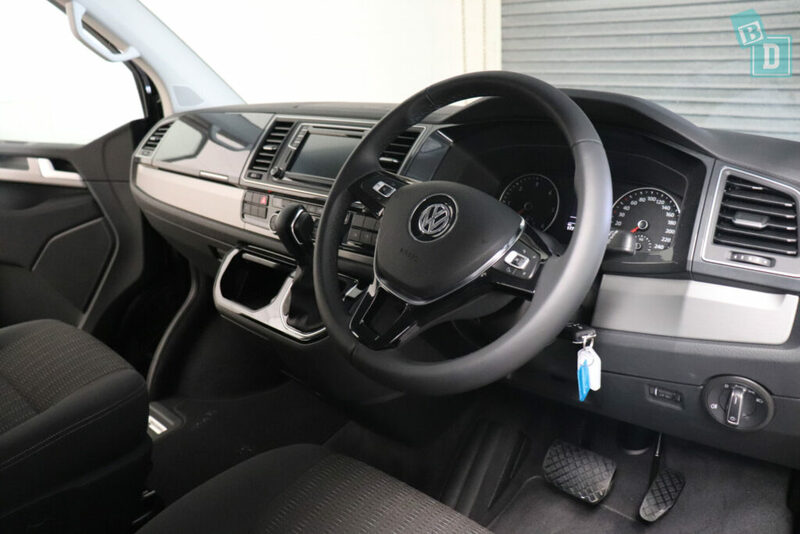 There are four large air-con vents across the front dashboard; one either side of the media screen and one at either end. The controls are below the media screen and pretty simple to use; you can control the rear air-con from the front too which is great because you can't reach the rear vents from the front. In the ceiling in the back are two rows of lights and aircon vents and their controls, when I travelled in the second row I found the vents a bit close to my head and I had to angle the direction of the vents so it wasn't giving me brain freeze! This would be hard to get right with little passengers who can't communicate yet exactly what they are feeling. I found it best to have the third-row vents on rather than the second row, then they weren't blowing down on anyone as they are not situated above the third-row. The vent controls are also very easily fiddled with by small passengers and found this with the vents and the interior lights. My daughter was constantly turning them on and I didn't notice so the lights would be left on. I couldn't reach the interior lights while I was driving. Visibility for the passengers in the VW Multivan is excellent. The side windows are nice and deep and it is so spacious and open that you can see out really well. 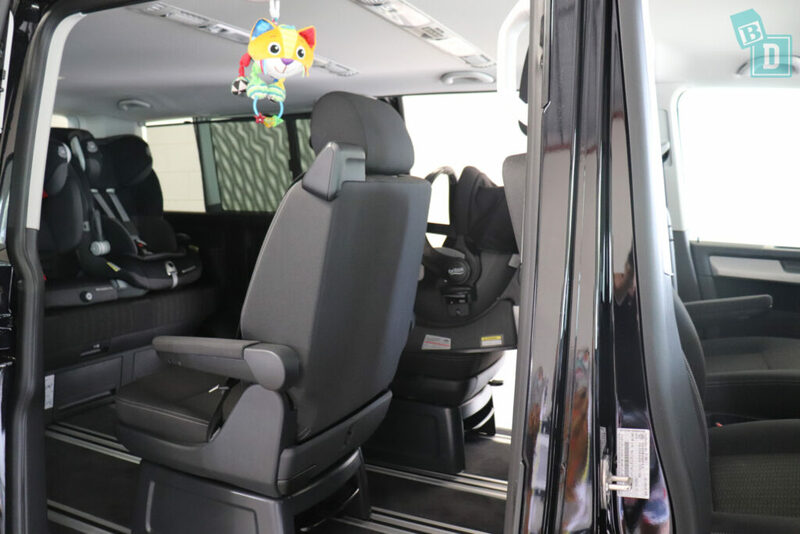 Also, with the seating position so high, children can see quite far whether they are in a forward or rear-facing child seat. If you put a rear-facing child seat in the third row and had the seats in the furthest back position you may find the sun shines into bub's eyes as the rear windscreen is flat and very big. 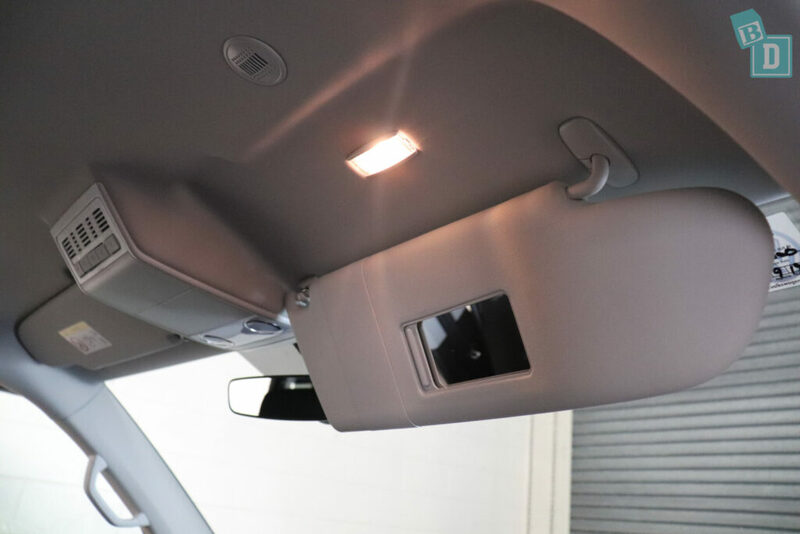 There are in-built window shades in all the rear side windows, which is fantastic for protecting rear passengers from the sun and providing privacy. For the driver, visibility is good to the front and sides, the higher driving position and large windows help enormously with that but there is no escaping the size of the vehicle and you have to be very careful using the side mirrors and reversing camera to make sure there is nothing in your blind spots in the back corners of the vehicle. One thing I have noticed since being a mum is I hate it when I reach a destination or get home from being out and Tulsi has either done really well in the car or she is screaming her head off and I have done really well to keep it together for the entire journey (usually the latter!!) and it takes 10 minutes to park the car! It can be really stressful. Usually I dread when we get big cars or Utes as they take longer in our tight apartment block carpark, the VW Multivan only just fit heightwise in our carpark and because of the length and size it was tricky to reverse park. I found when I went into car parks I had to be careful of the height restrictions and the long wheelbase meant I had to be more careful in the spiral ramp in multi-storey car parks. 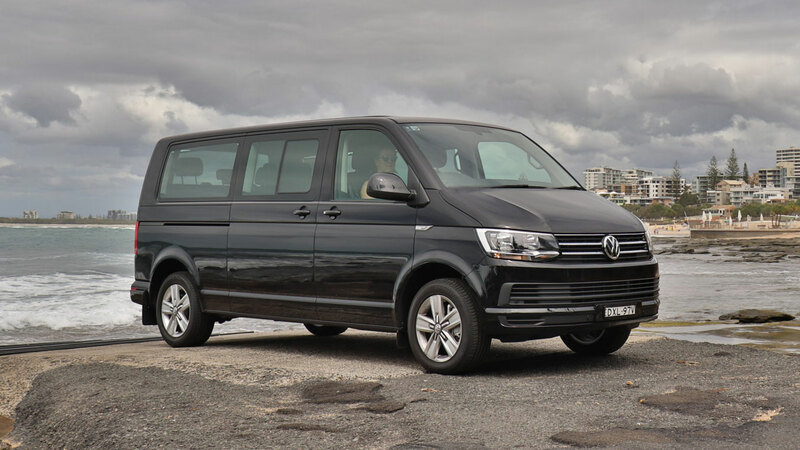 I have found the VW Multivan a surprisingly fun and practical car to drive on long road trips on the open roads as well as around town. I did find myself looking for two free parking spaces next to each other when parking, as it is a big vehicle to maneuver especially in small car parks. However, when there weren't two consecutive spaces I found reverse parking the Multivan easiest. 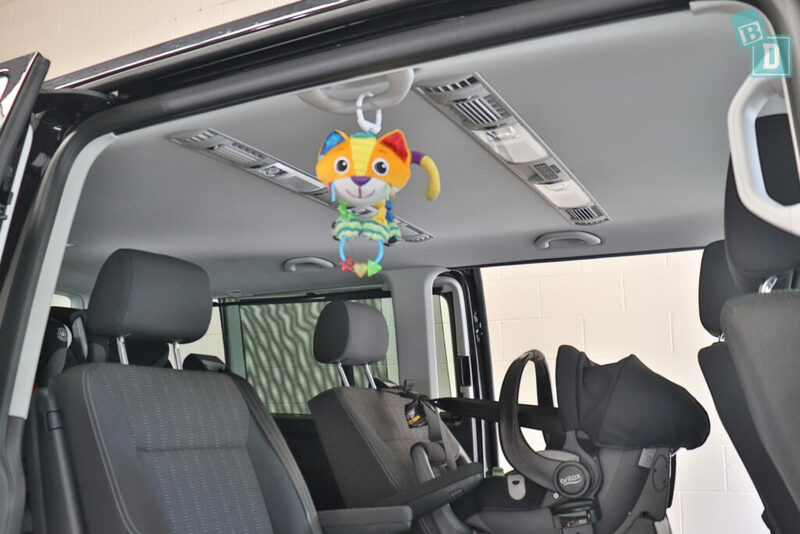 There are handles in the ceiling above the side doors and in the third row if you line the seats up with them then they are good for hanging a child's toy on. 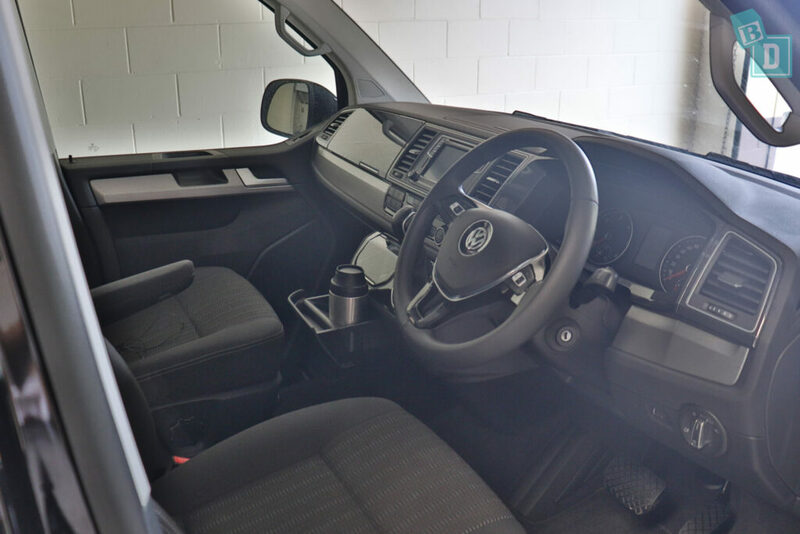 Generally, the interior of the VW Multivan is quite pleasant, it is not as van like as I had expected and had a lot of the creature comforts of cars with some added bonuses like being able to walk through and around the inside. 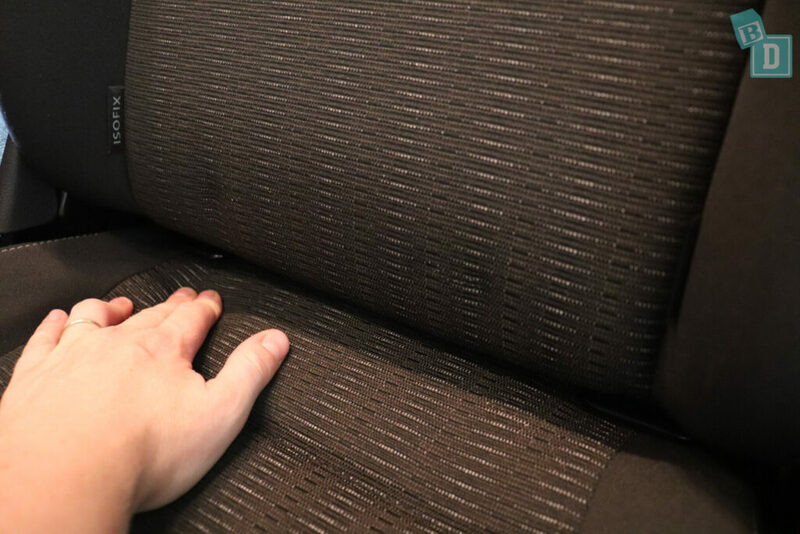 The interior surfaces would wipe clean easily too, they are all plastic or rubber and the seating and some door panels are woven upholstery fabric which would be harder to keep clean. 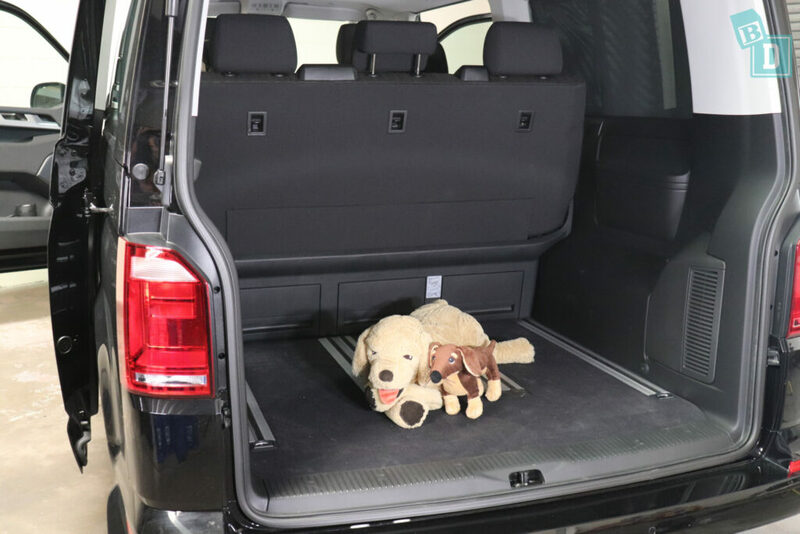 There are carpet floor mats in the front of the Multivan and the floor of the van is carpet throughout. 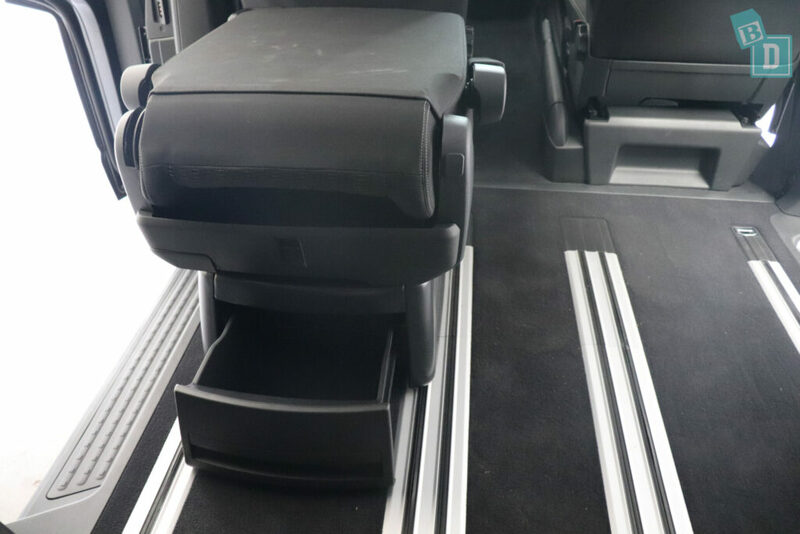 It is the kind of loop carpet that is quite hard to vacuum crumbs, sand and spills out of but makes the Multivan feel much more homely like a car than a van. I had to put the key in the ignition of the Multivan which was bizarre because most modern cars have a button start and I was constantly surprised when I got in to drive it! The tailgate is very big, I measured it sticking out 125cm from the back of the van, so in either the long or short wheelbase variants you really need to park nose in everywhere so you have plenty of room to swing the big tailgate open. 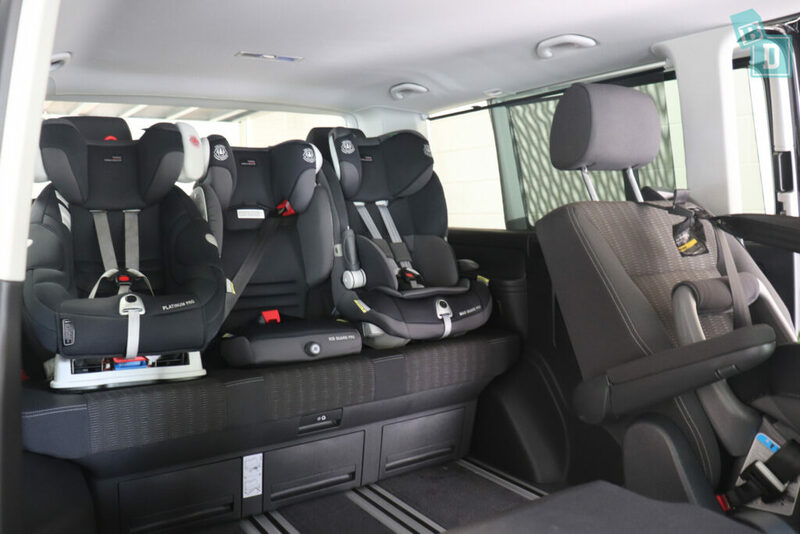 The VW Multivan has so many options, it can be a camper with a bed in the back, Esky and table, spin the chairs around and erect a table to create a boardroom in the back or have in-built kids booster seats. The VW Multivan does not have an ANCAP safety rating. 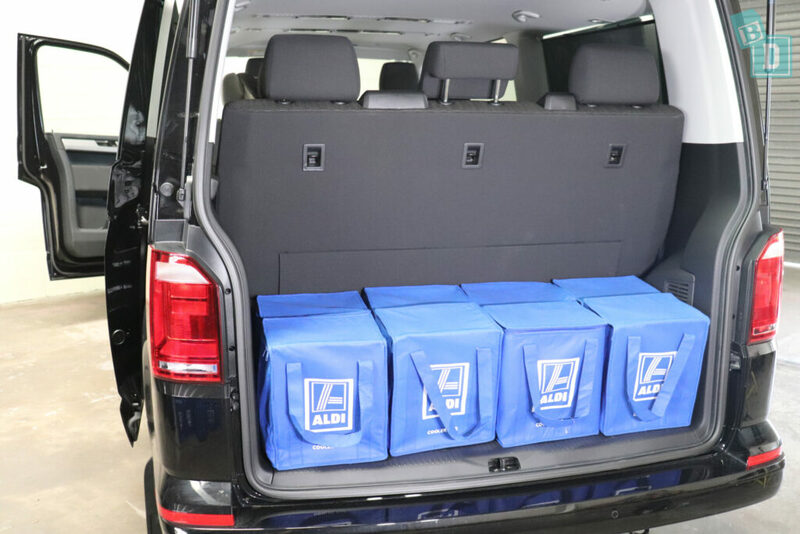 The VW Multivan has four airbags as standard. Both driver and front passengers get frontal and side head airbags. 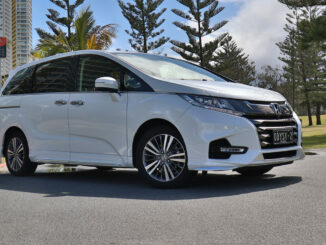 The side curtain airbags only extend to the rear side passengers in the short wheelbase variant of the Comfortline and the Highline as well but not in the Executive variant. As standard, the VW Multivan comes with multi-collision brake (MCB), electronic stability control (ESC), anti-lock brakes (ABS), brake assist system (BA), traction control system (TCS), electronic differential lock (EDL), hill hold control, driver alert (Fatigue Detection System), automatic headlight activation with separate daytime running lights, “Leaving Home” and manual “Coming Home” function. Blind spot monitoring (BSM) is only available as standard on the Highline variant and the short wheelbase Comfortline models. Forward collision warning (FCW) with city emergency braking (City EB) is only available on the Highline and Executive models.